Phyllo dough appetizers don't need to be difficult, while still generating impressive results. When you make appetizers using phyllo dough, you wind up with a flaky, golden small bite that looks as if it took a great deal of effort, yet working with phyllo dough is relatively easy. 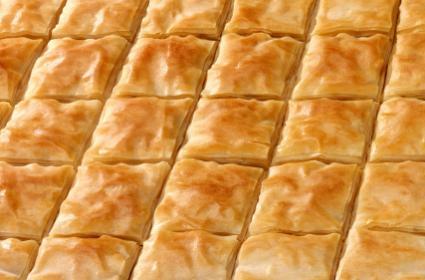 Used as early as the 11th Century in Turkey, phyllo dough has long been a staple of Greek and Middle Eastern cuisine. In its current form, phyllo dough comes as long, paper-thin sheets of raw pastry dough. When it is layered and baked, phyllo becomes intensely flakey, golden brown, and crispy. You can make phyllo pastry from scratch using a pasta machine to roll out paper thin sheets. Phyllo is made with basic ingredients you can find in any grocery store: flour, salt, olive oil and water. Commercially prepared phyllo dough, however, is far more convenient and there is little difference between using commercially prepared phyllo dough and making it yourself. You can find phyllo dough with the pastry dough in the freezer section of most grocery stores. The biggest problem people encounter when working with phyllo dough is that the pastry dries out easily because the sheets are so thin. Typically, frozen phyllo pastry comes rolled in sheets. Thaw the pastry overnight before working with it. When you work with phyllo dough, place parchment paper between each layer of pastry, and then place all of the pastry under a damp towel as you work with a sheet at a time. Work quickly to avoid drying. Phyllo becomes flaky by layering it. Most phyllo dough appetizers have several layers of phyllo stacked together and wrapped around a filling. To layer the phyllo dough, work with a sheet a time, brushing each sheet with melted butter before layering on another sheet. A stack of three to five sheets will make a nicely layered and flaky pastry base for your appetizers. When creating appetizers from phyllo dough, you can work with a Mediterranean or Middle Eastern theme, or you can use phyllo dough as flaky stand in for puff pastry and wrap it around all kinds of wonderful fillings. Here are some appetizers to try. Spanakopita is a traditional savory Greek pastry that can be used as a main dish or an appetizer. It contains spinach, feta cheese and traditional Greek herbs such as oregano and basil. Traditional appetizer presentation for spanakopita has squares of phyllo wrapped around the filling into a triangular shape. Squares of phyllo dough wrap around sautéed mushrooms, cream cheese and herbs to create a warm, earthy appetizer that works well for winter gatherings. Try this delicious mushroom and phyllo appetizer recipe. If you are a fan of crab rangoon, you'll love these phyllo crab puffs. Use a standard crab rangoon filling and wrap it in phyllo dough triangles. Bake in a 350 degree oven for 15 minutes. Phyllo can serve as a stand-in when you bake up a batch of brie en croute, which features creamy, melting brie cheese in a flaky crust of golden pastry. Some grocery stores sell miniature froze phyllo cups that you can bake and fill. Try this phyllo cup and shrimp salad appetizer, or come up with your own savory filling. Phyllo pastry makes a perfect appetizer base. With a little creativity, you can make delicious phyllo dough appetizers for your next gathering.